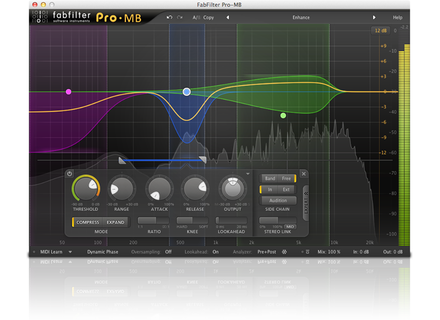 Pro-MB, Software multiband compressor from FabFilter. 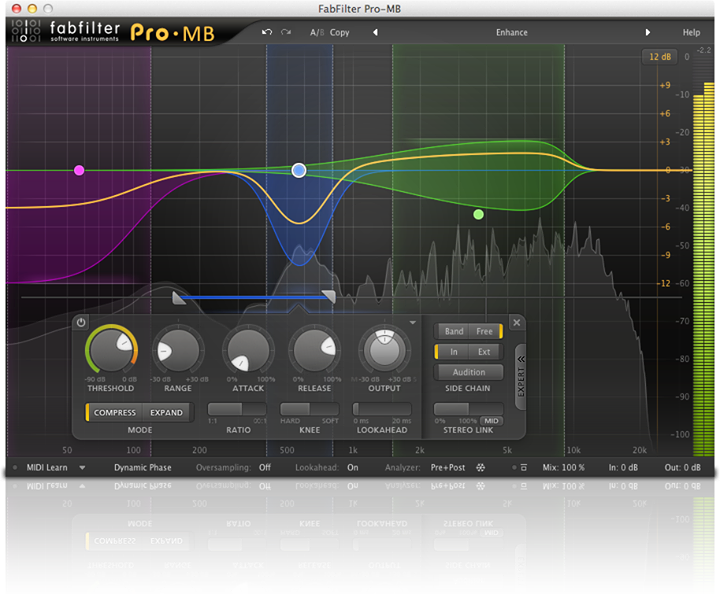 FabFilter announces the availability of its new Pro-MB multiband compressor and expander for Mac OS X and Windows. Pro-MB allows for working on 6 bands placed freely on the spectrum, and you can manipulate them to form a traditional crossover system. The plug-in is designed for a wide variety of dynamic processing, ranging from transparent compression to gating, pumping effects, limiting and more. For each band, you can control the threshold, frequency range, attack, release, output gain, ratio, variable knee and look ahead time (up to 20ms). Stereo linking option, Mid/Side processing, external sidechain input and triggering for each frequency band are also available. You can process the phase with three Dynamic, Linear (eliminates artifacts by changeing the crossover frequencies) and Minimum modes. You'll also find a crossover slope adjustment between 6 and 48dB/octave, a wet/dry mix control from 0 to 200%, smart parameter interpolation system, Undo/Redo as well as A/B comparison, solo/mute and bypass per band, oversampling 4x, MIDI Learn, frequency analyzer with pre/post and Freeze features, and an output level meter. Mono and stereo versions of the plug-in are included. Pro-MB is a VST, VST3, AU, AudioSuite and AAX plug-in for Mac and PC 32 and 64-bit. It is available for 169€ and you can download a demo version from www.fabfilter.com. LinPlug launches the beta version of Spectral LinPlug will soon release a new virtual subtractive synth for Mac and Windows, called Spectral, and offers you to test the public beta version. Liquid Notes updated to v1.5.1 Re-Compose has fully revamped the GUI of the Liquid Notes MIDI arrangement software, and lowers its price in October. Premium account launched for JellyNote JellyNote, the online music learning software, now offers a Premium account from 4.99€/month.